Watching the Oscars culminates a year of film releases and award shows. This year the Best Picture nominees group together films of extreme differences. Imagine a double-feature of La La Land and Hacksaw Ridge. Ok, don't imagine that. My favorite films were Lion and Manchester By the Sea. Both were emotionally engaging and structured like thrillers. For Sunday night I want to make a special plate of nibble-food, something that has some art and cultural diversity in its design. With that in mind, I hope you will try my use of a Vietnamese sauce to flavor the classic American bar dish, chicken wings. The best aspect of fusion cuisine is when you discover a combination of seemingly unrelated flavors or components that, once you’ve paired them, make you think they have always naturally belonged together. For me, the surprising match was an American bar food staple and an Asian comfort-food classic. The popular Vietnamese dish pho, a giant soup bowl filled to the brim with meat and noodles, is traditionally served with a basket of fresh green vegetables and bean sprouts.. For seasoning, a dipping sauce is also provided. As a matter of personal taste, I prefer the lighter pho ga, made with chicken, to its deeper flavored, beefy cousins. After years of eating pho ga I realized that part of my craving for the soup was because I loved the dipping sauce called nuoc cham gung. In the sauce, finely minced ginger and garlic mingle with flecks of dried Sichuan peppers in a vinegary-salty-sweet sauce, accentuated with lime-citrus notes. With one of those wonderful epiphanies that happen to people who think about food a bit too much, I realized that nuoc cham gung would make a good marinade and glaze for my favorite appetizer, Buffalo wings. 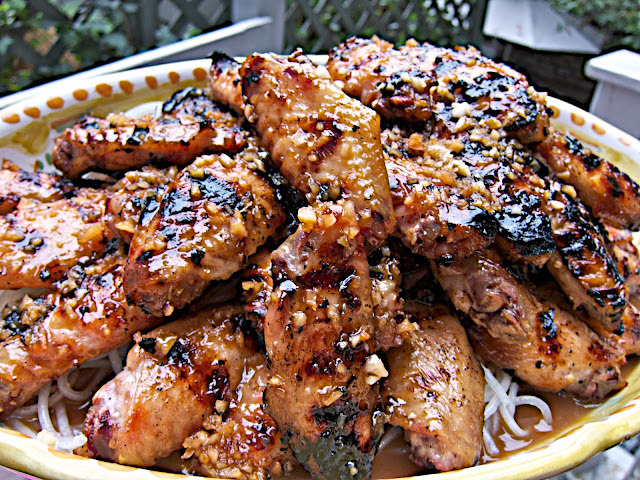 Chicken on the bone, cooked on the grill or in the oven, has a moist-sweetness that is accentuated perfectly by my modified version of nuoc cham gung. Because of its deeply flavored saltiness, fish sauce, variously called nuoc mam in Vietnam or nam pla in Thailand, is an essential ingredient in the recipe. Easily found in Asian markets, the sauce is inexpensive and lasts for years in the refrigerator. In a large non-reactive bowl, dissolve the white sugar in warm water. Add the other ingredients, stir to mix well and add the chicken wings. Transfer to a sealable plastic bag and refrigerate one hour or, preferably, overnight. Remove the wings and transfer the marinade to a small saucepan, adding the brown sugar. Stir to dissolve and reduce by a half or, if you want a thicker glaze, by two-thirds over a medium flame to create a glaze that should have a good balance of sweetness and heat. Taste and adjust for more sweetness if desired by adding another tablespoon of brown sugar. 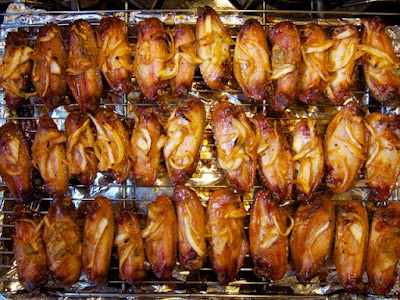 The wings can either be grilled on a barbecue or baked in a 350 F oven on a rack on a baking sheet lined with aluminum foil for easy clean up. Turn every 10 minutes. Cook until tender, about 30 minutes. Place the wings on a large plate of Asian noodles, steamed rice, or shredded lettuce. Just before serving, pour the hot glaze over the top. Making Passover dinner takes a bit of planning, but it doesn't have to be a chore. If you're cooking for a big group, hand out assignments so you don't do all the work. If your kitchen is large enough, invite people over to help. Cooking the dinner with friends and family can be as much a part of a celebration as the meal itself. Everyone wants to save money these days. But keeping an eye on food costs shouldn't mean cutting corners on quality and flavor. Avoid buying packaged or frozen meals and you'll be way ahead of the game. Besides saving money, you'll be eating healthier food. On Passover, I practice what I preach by using one chicken to make three dishes. My Jewish mother would be very proud. For me it's not Passover without matzo ball soup. But soup is only as good as the stock. Canned and packaged chicken broth are very high in salt content and, in my opinion, have an unpleasant flavor. It's much better to make your own. The broth can be made days ahead, kept in the refrigerator or even frozen. Also, when you buy the chicken, buy a whole one, preferably a free range or organic chicken, and cut it up yourself. Whole chickens cost under $2.00/pound, while chicken parts range from $3.50-$8.00/pound. If you haven't done it before, cutting apart a whole chicken is easier than you think. Having a sharp boning or chef's knife is essential. To remove the wings, thighs, and legs, slice through the meat and separate at the joints. Cut the wings apart, reserving the tips for the stock. To debone the breasts, glide the knife along the side of the breast bone. As you cut, pull back the breast meat, continuing to slide the knife against the ribs. For health reasons, I remove the skin and fat from the breasts, legs and thighs. Add the skin and fat to the stock. If you're going to debone the legs and thighs, add those bones to the stock as well. Drizzle olive oil on the breasts, legs, thighs, and wings. 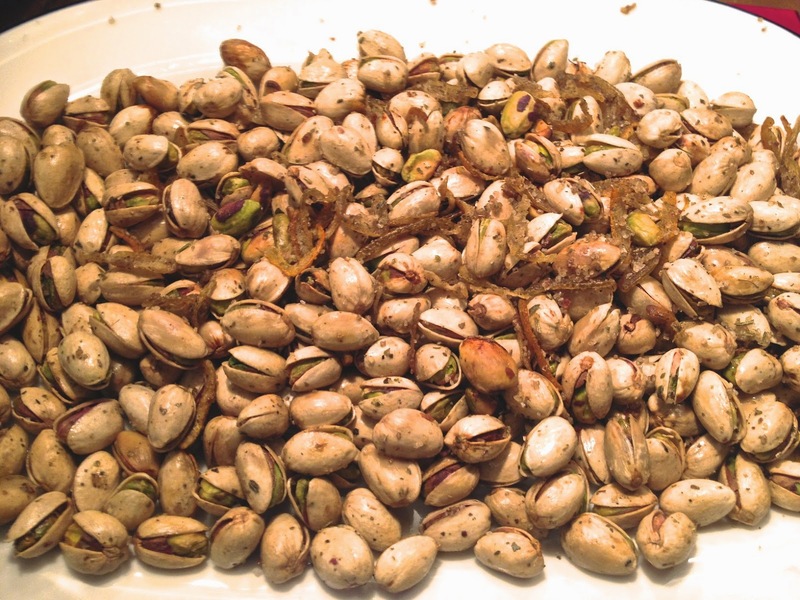 Put them into an air tight container and refrigerate. If you want to freeze them, put the pieces into a Ziploc style plastic bag, squ eeze out the air, seal, and freeze. Here's another tip about freezing the chicken. When you put the pieces into the plastic bag, make sure they don't touch one another. That way, if you need only one piece, say a breast, you can leave the other pieces frozen until you need them. When my mother and grandmother made chicken stock, they added onions, celery, and carrots to the water. I don't because I want the stock to taste of chicken. If I want other flavors, I add them later. Put the wing tips, skin, carcass, and bones into a large pot with the water, bring to a boil, reduce the heat and simmer for 60 minutes. Skim off and discard the foam. The volume will reduce by half. Strain the stock. Pick off any meat from the carcass and reserve for later use in a salad or a chicken-vegetable soup. Discard the bones and skin. Refrigerate overnight to easily remove the fat solids. If you're rushed for time and need the stock right away, float a slice of bread on top of the stock to absorb the fat. The stock can be kept in the refrigerator in an air tight container for a day or two or in the freezer for months. For the matzo balls, we use a mix, but if you want to make them from scratch, Mark Bittman has a very good recipe. Prepare the matzo balls per the directions on the box. Make them large or small as you like. Remember that the size of the matzo ball will double as it cooks in the salted water. 1 box of mix will make 24 small matzo balls or 12 large ones. Put the chicken stock into a large pot. 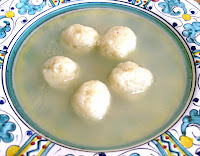 Use a slotted spoon to transfer the matzo balls from the salted water to the stock. Heat over a medium flame. Because the matzo balls are delicate, don't let the stock boil. On any other day but Passover, serve the sliced chicken on top of buttered pasta. Put the breasts in the heated pan, top with parsley and garlic, drizzle with olive oil, and bake for 30 minutes. Slice the breasts and plate. Use a rubber spatula to remove the drippings, garlic, and parsley and spoon onto the slices before serving. Heat the olive oil in a large sauce pan, season with sea salt and pepper, saute the chicken until lightly browned. Remove from the pan, drain on paper towels, set aside. 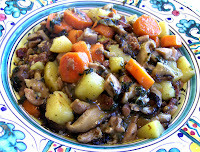 Saute the garlic, shallots, mushrooms, carrots, parsley, and potatoes until lightly browned. Return the chicken to the pan. Add 3 cups of water. Simmer for 45 minutes until the me at is tender. There should be 1 cup of broth. Taste and adjust the seasoning. Continue simmering another 10 minutes. Serve with steamed spinach or broccoli. Days at the beach, long hikes into shady woods cooled by running streams and gatherings on the grass in parks set back from the road, all cry out for picnic lunches with salty, savory dishes. Each dish should be a treat, a respite from the heat and the exertions of the day. A cheese sandwich with a good comte or brie with a slice of ham on whole wheat bread or a fresh baguette is a good start. Bring along homemade Moroccan style pickles or kosher dills and a snack becomes a feast. These days many supermarkets have deli counters selling made-to-order sandwiches and prepared food that can be basic (salads, meatloaf, baked chicken breast and cold pasta) or elaborate with gourmet ingredients and high prices to match (arugula salads, grilled vegetables, large shrimp with remoulade sauce and baby back ribs with a whiskey glaze). A little bit of effort--not too much effort because who wants to be in a kitchen when it's hot outside--and the picnic basket can be filled with home cooked dishes that will refresh and delight your friends and family. For the Fourth of July, a pot-luck picnic is a great way to go. We invite our friends to meet us at 6:00pm at the park across the street from the high school where the fire works explode overhead as soon as the sun sets. In the morning, we lay out plastic tarps to protect against the damp of the ground. Then we spend a few leisurely hours during the day preparing easy-to-make dishes to contribute to the meal that stretches over several hours as we catch up with friends and wait for night to fall. Super easy, super delicious, beet salad is perfect for picnics. The beets my mom served when I was a kid were either boiled or canned. For some reason she never roasted beets until I made them. After that they were her favorite. Not soggy, the beets cook inside their skins, retaining all their sweetness. They taste great and they're easy to make. Cut off the leaves and stems, reserving them to use later. A quick side note: after you wash them, if you chop up the leaves and stems, sauté them with olive oil, garlic and shallots; they'll caramelize and you can serve them as a side dish or tossed with pasta; they're delicious. Thoroughly wash the beets to get rid of any grit. Do not remove the skins or cut off the root. Preheat the oven to 450 F. Put a sheet of aluminum foil on a baking sheet. 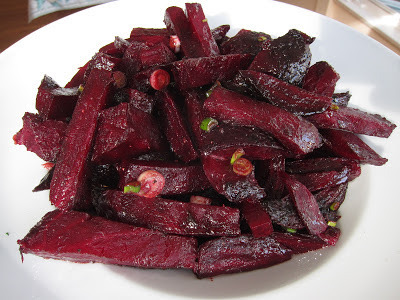 Place the beets in the pan, drizzle with olive oil, and bake for 45 minutes to an hour. Turn the beets every 20 minutes so they cook evenly. Use a wooden skewer to test if they're done. Roast until the skewer goes into the beets easily but don't let them get too soft. Al dente is good. Let cool, then peel off the skins, cut off the root and the top part and discard. Serve them up the way you like--julienne, rounds, or roughly cut--put them in a bowl and dress with olive oil, reduced balsamic vinegar, sea salt and black pepper. Use a vinagrette dressing, add feta, sliced scallions, and chopped Italian parsley. Add green grapes sliced in half. 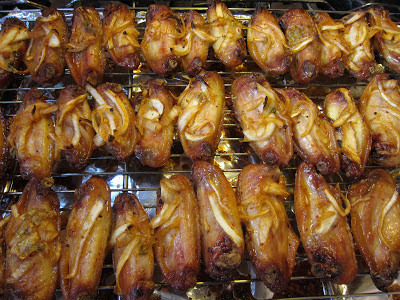 The wings can be cooked the day ahead and refrigerated, then reheated before the picnic. 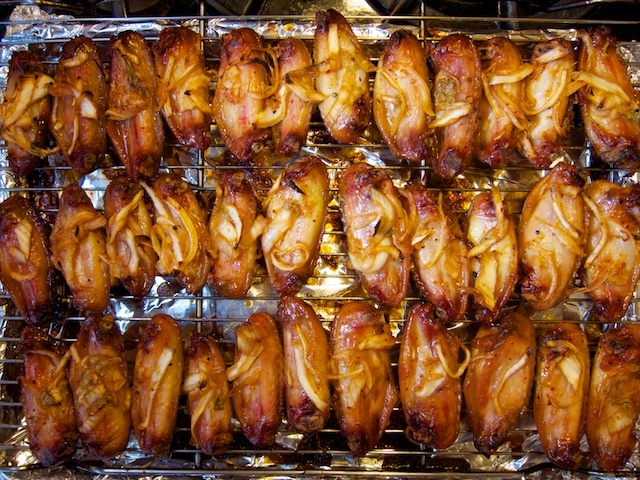 The wings are delicious served hot or at room temperature. When you cut up the chicken, separate the two parts of the wing and cut the breast meat off the bone. Keep or discard the skin as you wish. The breasts can be left whole but will cook more evenly when cut into strips or tenders. The legs and thighs can be cut in half if you have a heavy chef's knife. Toss the chicken pieces with olive oil and season with sea salt and pepper. Put the pieces in a container, add the buttermilk, 1 tablespoon of the rosemary, stir, cover, and refrigerate overnight. Using a wok or deep frying pan, heat the cooking oil to 325 - 350 degrees or until a piece of parsley browns immediately when dropped in the oil. Before you begin cooking, prepare your counter. Have a slotted spoon or an Asian style strainer ready. Lay two paper towels on top of a piece of brown grocery bag paper on a large plate. 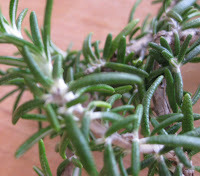 Reserve 1 teaspoon of the rosemary to use just before serving. In a brown paper bag mix together the flour, sea salt, pepper, rosemary, cayenne (optional), sugar (optional), and onions (optional). Remove one piece of chicken at a time. Shake off the excess buttermilk, drop the piece into the paper bag with the seasoned flour, close the top of the bag, and shake. Repeat with all the pieces, assembling them on a plate or cutting board. Cook the chicken in batches. Gently drop each piece into the hot oil, making sure it doesn't touch the other pieces so each one cooks evenly. Turn over when browned on one side. Remove when golden brown and drain on the paper towels. 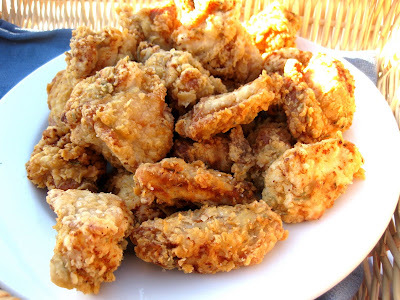 The pieces will cook quickly: chicken tenders (breast) 2-3 minutes; wings 7-8 minutes; thighs & legs 10-12 minutes. Just before serving, lightly dust the chicken pieces with 1 teaspoon of rosemary, sea salt and pepper. If you are making deep fried vegetables like onion rings or broccoli florets, they cook even more quickly: thick rings cook in 30 seconds, thin rings in 5-6 seconds; broccoli in 30 seconds. Soak the vegetables in the seasoned buttermilk for a few minutes, then process like the chicken pieces.